Orthodontic treatment can increase the chances of getting white spots (decalcification) and or decay when oral hygiene is poor during treatment. This can happen with traditional braces or Invisalign. When a patient has braces on, the brackets, wires, etc. tend to trap and collect food around them. 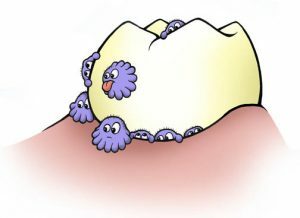 The food that we eat is also eaten by the bacteria in our mouths that cause decay and gum disease. The more that food is left on the teeth, the greater the chances are that a patient will get white spots and/or decay on their teeth. This can also happen with Invisalign. If an Invisalign patient removes their aligners to eat, and then puts them back in with out brushing, all of that food becomes trapped between the tooth and the plastic aligner, holding it there for the bacteria to eat. 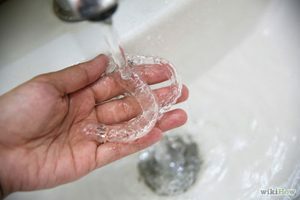 With Invisalign, it also also very important to remove the aligners and at least rinse with water afterward when drinking anything other than plain water. The reason for this is twofold- Many drinks have sugar in them. 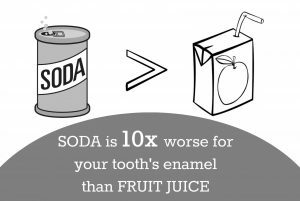 If you allow that sugary drink to sit inside of the aligner, it is feeding the bacteria. Many drinks are also acidic, and again, if they get trapped inside the aligner and sit against the teeth, that acid will eat away at the enamel. Good oral hygiene is very important to us and we want our patients to be successful with it. When our patients start treatment we give them several “tools” to help them achieve that success. The most important of those “tools” is an Oral B electric toothbrush. 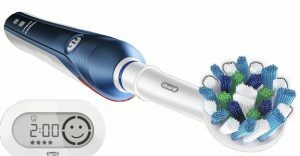 The electric toothbrush is more effective at cleaning around the braces. It also motivates our teen and adolescent patients to brush because they think the brush is “cool”. We also stress to our patients and parents that regular cleanings and checkups every six months with their dentist and hygienist are essential to good oral health during their orthodontic experience.